Shopify is one of the most widely used ecommerce platforms available today as of 2018. One of the great features of Shopify is the large amount of apps available to extend the core functions of the platform. 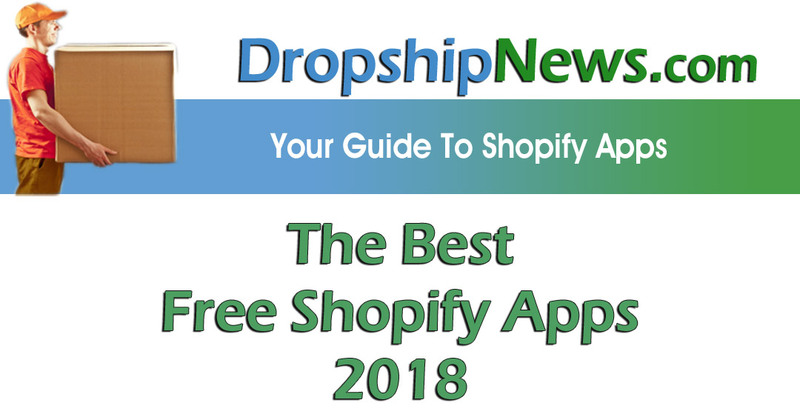 In this article we will discuss what we think are the Best Free Shopify Apps of 2018. Yes shopify is great out of the box, however you can add apps (applications) to make it do even more. With over 16,000 apps and growing in the Shopify App Store, choosing which are the best free apps is not an easy task. Fear not, we've done the work for you. We asked our e-commerce group members on Facebook to tell us about their favourite free shopify apps and which they think is the best. Their answers helped us to compile this list of free shopify apps and who doesn't like free stuff. Please note these apps are not listing in any particular order, they are randomly listed. Some users may prefer one over another for a specific task. Oberlo is an app for sourcing and adding products to your Shopify store. You can use Oberlo to import products directly from Aliexpress with a click of the mouse. It also features a chrome extension to help place customer orders direct to aliexpress. The best feature for me is the product filtering. You can set maximum price, if the supplier ships to your country, if the supplier uses E-packet or not and much more besides. In addition to the aliexpress Oblerlo have their own marketplace of suppliers. You can search for and add products from the Oberlo marketplace directly into your store. Mailchimp is one of the leading marketing automation services. Operated by the Rocket Science Group since 2001. They originally started as an email automation service for email subscriptions and emailing lists. Today in combination with Shopify it can do much more. It allows store owners to create automated marketing campaigns to boost your store's profitability. You can promote your business and grow your audience with Facebook and Instagram ad campaigns. You also have the ability to recover abandoned carts, customize order emails, follow up on customer orders and send personalised product recommendations. And the best bit is it's free for your first 2,000 subscribers, and who doesn't like free. Privy’s integration with Shopify and Shopify Plus lets you set up your account in seconds and get your first campaign live right away, for free. Privy's free suite of email capture tools, including exit-intent driven website popups & banners, help you grow your email list from your Shopify store, social media channels, mobile, and in-store traffic. All without any coding or development skills needed. Trusted by over 82,000 Shopify stores. Over 4,500 ★★★★★ reviews and 700 MILLION images processed. According to a study of U.S. web-based searches, the world’s second most-used search engine is Google Images! Install SEO Image Optimizer and improve your Google Search Result rankings in a couple of clicks!.. Set once and instantly draw more traffic. Choose from our default ALT template or create your own. Grizzly Apps the makers of The Best Currency Converter believe that your customers shopping experience should be pleasant and easy, encouraging them to buy and making them come back for more. They made it to #6 in our best free shopify apps 2018 list. By helping your customers shop in their local currency you decrease customer frustration and cart abandonment. Their app helps you do this by converting your prices to their local currency, automatically and based on their location. Do you know that an average bounce rate is around 50%, meaning that about half of people who land on your website leave and don't come back? Marketing costs, obviously you want to take advantage of every visit to your store.But how? Better Coupon Box will help to turn every visitor into the potential customer. When customers first enter your store, a beautiful and responsive popup will show up to offer them a discount for following one of your social profiles. We have optimized User eXperience to the smallest, on both frontend and backend of the app. We aim to make Better Coupon Box the easiest and most simple app for you, which works great on all devices: desktop, tablet, and mobile phone! Get Better Coupon Box to increase your sales results today! With Better Coupon Box, not only your customers feel more motivated to engage with your store, but you can also start converting quickly. "Wow, I have 10% discount. Let’s see what I can use it for!" Bingo! You have just kept that customer stay longer on your site, which means more time to discover your awesome products, more chance for purchasing decisions. How do you think about increasing your revenue by 50% for FREE? Go live with Better Coupon Box in just a few minutes. Start converting your visitors now! 35,000 Shopify entrepreneurs can't be all wrong. Install AfterShip to track all your shipments in one place and give your customers the information they need about their delivery. Customers love delivery updates. Improve your customer satisfaction by sending email or SMS delivery status updates. Send from your email address, customise content and insert one-click tracking link. You can choose to send notifications when shipments are in transit, out for delivery, failed attempt, exception or delivered. Countdown timer to create urgency for your deals. Drive customers' actions and urge them to buy before time runs out. Create urgency and scarcity in every possible way with Countdown Cart - the latest Beeketing FREE app. Customers tend to delay buying. Why should they make a decision quickly if they don’t have to? Countdown Cart helps to persuade customers that the time to buy is NOW before it’s too late by creating a strong sense of urgency and scarcity for your Shopify store. Countdown Cart is FREE, "multi-featured" and ridiculously easy to use. Install the app with 1 click now and enjoy the awesome benefits it brings to you. How to use and How it works. Basically, all you need to do is just to install the app. And then it will just work right away. After installation, immediately, you’ll get 3 powerful widgets on your product pages showing the scarcity as well as the popularity of your products. These widgets are your influencing tools that raise the urgency to make customers buy faster and create a significant increase in your sales. Countdown timer: Give every customer an ultimatum; To buy as soon as possible to not lose the deal if the countdown hits zero. The easiest and quickest way to convert sales. Social proof: Highlight the popularity of your products: The feature shows, in real time, the number of visitors who have viewed your products and how many of them were sold. It creates a positive influence, builds trust on your brand and motivates them to buy your products. Stock countdown: Show how many items left in stock of every single product in your store. Increase the perceived value of your products and make your customers want it more because they think that these products are running out. Responsive and highly customizable designs. Mobile shopping is exploding and we will not let your mobile sales leak. Regardless what devices your customers are using, the display of Countdown Cart on your online store is responsive to all, from mobile, tablet to small-screen desktop. Also, you get the most control over the app with customizable messages, position or even display time. Make it perfectly fit with your store. 100% FREE with all the sales-driven features that you have to pay to use with other apps. The most lightweight app you’ll ever install. It is more like an element of your store, not an add-on. Suitable for businesses of all scales. One-click installation, no coding required. How do you stay friendly and helpful to your customers, and increase sales at the same time? The key to never miss any sales is to be a casual and helpful friend, not a seller. Facebook is among the most popular social media that customers use, in fact, about 74% of shoppers are frequently active on Facebook. So why not leverage your Facebook account and make it the most friendly customer support channel ever? Your customers can use their own Facebook account to chat directly with you on your store, without having to create a support ticket. After that, both you and your customer can follow up the conversation any time, anywhere with Facebook messenger accounts. With Quick Facebook Chat, you are chatting with their personal Facebook profiles, not just anonymous online accounts, so you can personalize your conversation for each of them. It’s never easier to get closer, build trust and establish the relationship with your customers like between real people, and what’s next, more sales are coming your way! Why should I use Quick Facebook Chat? Super easy and simple to install, no coding required! Record all conversations in Facebook in-box, follow up any time and anywhere. View customer's Facebook profiles and personalize messages. What benefits my customers if I use this app? Get personal and immediate support from store owners. Easily revisit conversation without creating support ticket. When you're ready, put Kit to work—free. No experience in online advertising to drive traffic and make sale. So there you have it, the best free shopify apps for 2018. Do you have a favourite free shopify app you'd like us to add to this list? Thanks for the amazing apps Dan! To add up the list, here are my favorite free Shopify Apps that I can suggest for any store. Happy Email – to send thank you email to new customers automatically after sign up or the first purchase. Plug in SEO – identifies the issues with SEO and recommend the fix. SearchIQ – to search products instantly and improve search experience. Compass – track all important ecommerce metrics, benchmarks and industry insights. Thanks for this article. But is there any free app about featured products slider? Hi! I like your list! There is also an app – Heraldbee. It makes Google Shopping ads according to Shopify product feed. It was free, when I used it.